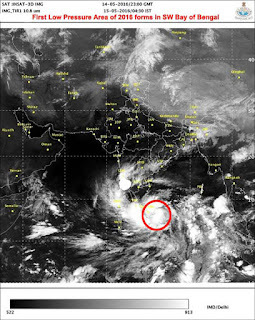 "A low pressure area has formed over equatorial Indian Ocean and adjoining southwest Bay of Bengal. It is likely to become well marked low pressure area and further concentrate into a depression during next 48 hours." 1. Satellite images from IMD : IR and other images are available from IMD including animations. The images are updated every 30mins. 6. STH stormwatch ie this blog.